Uterine Fibroids – What Do I Need to Know? Fibroids are extremely common and affect more than 60% of women. However, even though it sounds a bit frightening that so many women have tumors in their uterus, fibroids rarely turn into cancer and having them doesn’t mean you’re more likely to get uterine cancer. Many fibroids are too tiny to see with the naked eye and can often be safely ignored unless they are interfering with your health. But What Are Uterine Fibroids? Uterine fibroids are muscular growths, or tumors, that can grow on your uterus. Fibroids vary in size, shape, and location. They can attach to your uterus or uterine wall, with the fibroids that grow in the muscle of the uterus being the most common. Typically, only if they become large do these fibroids create problems, such as painful menstrual cycles. If they grow very large, they could push on the bladder or colon, which adds pressure and might cause frequent urination or constipation. Fibroids that grow on the inside of the uterus (submucosal) are often more concerning. They can cause heavy, painful cycles and interfere with your ability to get pregnant. This type of fibroids can be removed with a minor surgical procedure. Researchers don’t know why women develop fibroids. Uterine fibroids usually appear in women who are between 30 and 40 years old. They are also more common in African-American women. Besides age and race, there’s evidence that family history also increases your chances of developing uterine fibroids. There is no known prevention for fibroids, but some research suggests certain lifestyle habits can reduce your chances. One study found that diets high in red meats and sugar may be linked to a higher risk of uterine fibroids. Another study found that eating fruits and cruciferous vegetables could lower your chances of developing them. Cruciferous vegetables, such as broccoli, cabbage, arugula, cauliflower, and greens are rich in beta-carotene, folate, vitamins C, E, and K, and other minerals. Eating a diet full of fiber and regularly exercising can also lower your chances of uterine fibroids. Fibroids are common and are typically not dangerous. If they are not causing problems, they can be left alone and monitored. But if they are causing pain or bleeding, pressing on organs, or you and your doctor suspect they could be causing infertility, there is no need to suffer. Talk to your doctor. 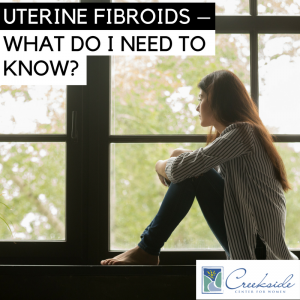 At Creekside Center For Women, we have lots of great tools to deal with fibroids and their symptoms.